By far one of my favorite blogs to read. It makes me want to travel to beautiful France. Great informative and fun blog! Make sure you keep posting more! This is the only blog I read regularly. Diane is a dog lover who is full of hilarious wit, I look forward to her stories for a daily chuckle. Keep it up! I am either smiling or laughing very hard after reading this blog. One of my favorite blogs to read. It's fantastic!! Having lived the expat life, OuiInFrance is right on target. I love reliving experiences through this blog and the musings are dead on! BEST BLOG BY FAR! Love this blog -- makes me want to move to France ASAP! Excellent blog! I am both an ex pat (in Spain) and the owner of a new site www.holidayhomeadvice.co.uk. On both counts I can really resonate with Diane's musings and love how she puts certain situations across so well, and with a good sense of humour. I liked her blog so much that I invited her to do a guest piece for our site. Always witty and sharply observed every day situations that many of us find ourselves in. A great read - just the right length to keep my attention and a wide range of subjects keeps it fresh and alive. I knew Diane briefly in the US, and then she moved to France. I feel like I'm travelling with her every day and learning things about a familiar (or so I thought) culture, that I never would have known. The blog is heartfelt, humerous and candid. It is the only one I read. Kudos to her! I look forward to hearing her musings every day. This is great! Well-written, amusing and informative. What more can you ask for? Love this blog, i'm ready to catch a plane to France to see all of the beautiful places in Diane's travels. Love this blog! I love Paris and Diane is a great writer. Excellent blog by someone who is a keen observer of humans and their pets. Love Diane's sense of humor and way of looking at things! As a French buff, and dog lover myself, it's great to be able to connect with her on so many ways and be entertained while doing so! I also have a very short attention span so I love how Diane keeps her blog posts concise and to the point, yet still contain great information! Love getting updates in my mailbox everyday from the blog. It is always interesting to hear Diane's opinion on life in France! Keep up the good work! I'll probably never have the opportunity to visit France, so I love to read this blog! Diane provides the perspective from the point of view of an American, and as a dog lover, both important to me. This blog is humorous, and gives me enough of a taste of France that I'd love to visit! Keep it up! Great blog! Keeps me entertained, informed and wanting to read the next! Don't stop writing, please! I love the range of topics Diane writes about in Our In France. From the latest trips she's taken, to pet peeves about living in Europe, or stories about her dog, Dagny, there's always something new and interesting to read about. Her voice is distinct as she writes in such detail, humor and open mindedness. Check out this blog and you will not be disappointed! As a french person, I love hearing a different perspective about our way of life! Really entertaining to read, illustrated with nice pics, informative, funny...I really admire Diane's work! This blog is extremely well written and always puts a smile on my face. I love the photos as well as the writer's perspective on life in France. Diane shares interesting perspectives and very often laugh out loud posts about being an American expat (+dog lover!) in France... a must read blog! DIane's blog is fantastic! Great voice, very informative, and always a great perspective. I always look forward to reading it! Love this blog! Love learning about life in France and hearing about Dagny's adventures! Diane's blog is a perfect mix of info on French culture, pictures of her travels and her hilarious stories along the way. A well-done blog all the way around. Two thumbs up! I was delighted from Day One when I stumbled into Oui in France! I have learned so much about the French culture and customs through her blog, I have salivated over photos of delectable food, I have laughed and been educated and entertained. I LOVE HER BLOG! I love reading the author's insights into expat life in France. She makes me feel like I'm right there with her, experiencing the real country -- not some tourist version. And hey, ya gotta love the dog. It's such a gorgeous blog!! I'm a huge fan of Diane's blog. I don't always comment, but I always read it and it's so much fun for me to check out what she's up to. 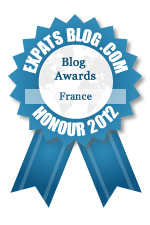 Oui in France definitely has what it to takes to WIN your Expats in France Blog Award. I subscribe to Oui in France because soon I will become a first time expat. . .This blog is awesome because she shares her life and adventures in a very open way. I just heart this blog! I am a work at home mom with four dogs and a human toddler. I rarely leave my house or even put on pants. Thus, I live vicariously through Diane's adventures which are even better than Law and Order marathons. I am addicted to this blog. Sometimes I think about what it would be like to move to France and since it's pretty much not an option for me, I like to live life vicariously through Diane. A very worthy blog! Great blog. I'm French and left France 8 years ago, it's nice to read your perspective. Interesting posts and lovely design! Great blog. I always look forward to reading Diane's latest posts. France has been on my bucket list of places to bring my boys, and now, via her blog, I feel I am more prepared for when we finally go on this trip. I like this blog. Good, focused content and lovely design. Great mix of topics from everyday stuff to myths you might not know about. Cool web design too! One day I'll visit France, but until then, I have this blog. Love the stories and practical info as well as the photos. Keep up the good work! clever , funny, as well as informative. Love this blog. Beautifully written. Write on! Dagny is so darn cute and Diane is a hilarious, witty writer. I LOVE this blog! Cool blog and cute dog! Love the funny stories, keep it up! I'm a new reader and really like this blog. It's cool to see what expat life is like although I probably won't be living abroad anytime soon. Pics are great too! Absolutely worthy of an award. I really like this blog and look forward to getting updates!